Malawian female boxer, Ellen ‘Tigress’ Simwaka, who is currently plying her trade in South Africa, is in Arbadeen, Scotland, for this week’s Saturday night fight against Scottish Kirsten Fraser for Commonwealth belt. Simwaka, 22, is the current WBF International bantamweight champion and will contest for the unoccupied Commonwealth belt which has also never been won by neither an African female boxer nor a Scottish female boxer. The title was formerly called ‘the British Empire title’, and was once won by a man from Nigeria, Richard “Tiger” Ihetu way back in 1950s. 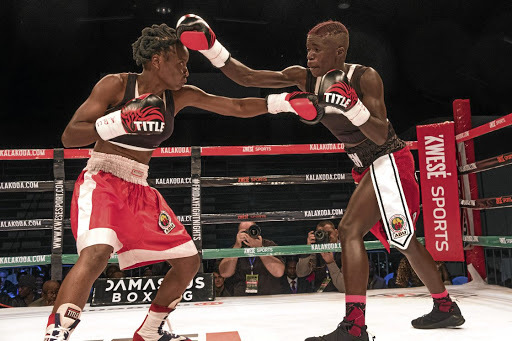 In search for greener pastures, the youngster left Malawi for RSA in 2015 with her then trainer, Rodger Kumwenda, and later on found another trainer, Rocky Weinstein, and has so far won WBF International title in July this year. Since the Tigress started her professional boxing career, she has managed to win seven times, has lost four times and she has drawn twice. In an interview with, Evening Express of UK, she said she will frustrate and beat Fraser in front of her own crowd. “I want to tell Kristen Fraser that I am coming for her in Aberdeen. “That Commonwealth title belt is mine. They are just keeping it for me until I win it in Scotland,” she boldly claimed. Meanwhile, 30-year-old Fraser is holding an impressive record in the previous fights, winning all of her last five fights as per boxrec.com.